“Please don’t rain yet. Please don’t rain yet. Please don’t rain yet.” My mind looped this mantra, and I plastered an everything’s-alright smile, hoping my face wouldn’t betray my anxiety. 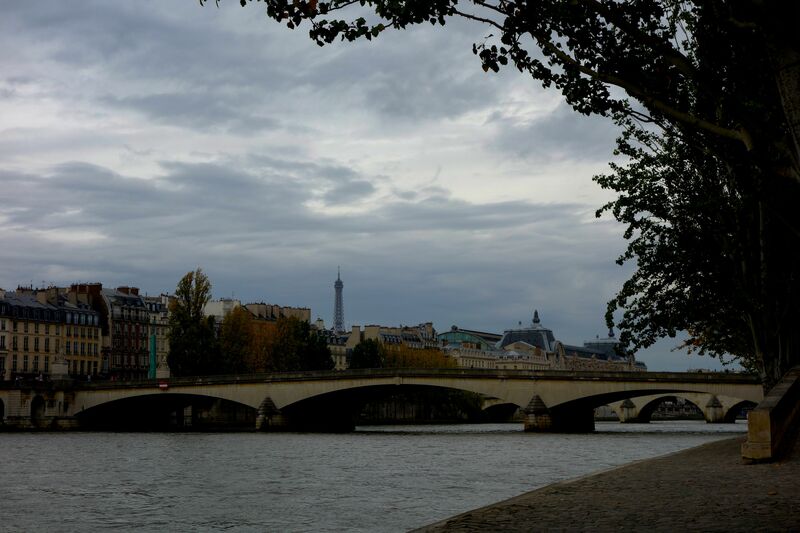 Twenty-eight people were following me through the cobblestone streets of Paris, and I didn’t want their only two days with me in my favorite European city to be flooded with memories of torrential downpours. Last night was tough enough. 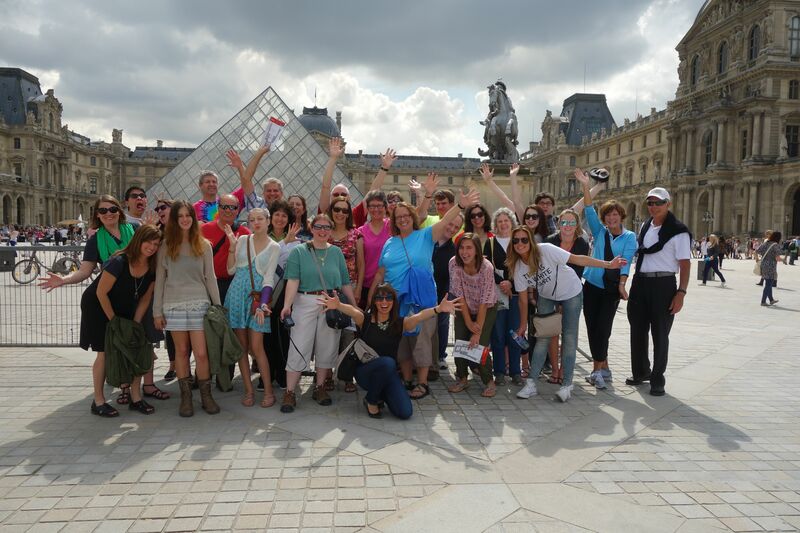 With most of them jet-lagged, my eager tour members earnestly willed themselves to stay alert and engaged during our Welcome Meeting, neighborhood orientation, metro lesson, dinner, and Seine River cruise. It’s hard for most people to maintain energy and high spirits after a sleepless ten-hour flight, feeling disoriented in unfamiliar surroundings, and hitting a language barrier wherever they turn. Throw in bitterly and unseasonably cold temperatures and buckets of rain, and even the cheeriest of travelers can get grumpy. We all want our travel dreams to come true, but when you end up either stuck inside a crowded, muggy boat with all the windows fogged up or shivering on the narrow deck, jostling for any coverage to protect you from the chilly rain that’s striking you sideways, travel dreams slowly dissolve into nightmares. Dark clouds roll in on the City of Light. Today, I just needed 20 minutes more to finish my Historic Paris walk. The weather had held out the entire morning, but the clouds were shifting from light to charcoal grey, and you could smell moist electricity with every shivering inhalation. We were almost at the crosswalk that would lead us away from Notre Dame into the Latin Quarter when the sky cracked, unleashing its contents all over the city of Paris. Umbrellas couldn’t open fast enough (if you had one to begin with), and instantly, every one of us was soaked. Lightening zapped and thunder pounded, and my tour members looked utterly defeated. It was impossible to know how long the watery onslaught would continue. Rather than make them more miserable by dragging them through flooded medieval Parisian streets like sad, wet puppies, I ended the walking tour, encouraged them to find a silver lining in these storm clouds, and set them free to do as they pleased. I lingered for anyone who wanted advice on transportation, lunch options, and ideas for what to do next to salvage their waterlogged morning. When the sun is back out, everyone is ready to embrace any experience in Paris. What intrigued me is that not one of the wanted to go back to the hotel. Sure, they all wanted to escape the deluge, dry off, mentally recover, and get some nourishment, but every single tour member seized the opportunity to explore Paris. The next morning they told me of the museums they visited, cafés terraces where they people- and storm-watched and where the waiter was “soooo nice;” pastry shops where they found their new, favorite dessert; and charming neighborhoods they wouldn’t have explored had they just decided to hunker down in their hotel room. We couldn’t have anticipated how that day would end up, but all of us made it work. They had all come on this tour to enjoy Europe, and in that moment, they all did exactly that and made me proud. Now if you’ve ever been to the high Alpine Lauterbrunnen Valley of Switzerland’s Bern-Oberland region, you know that when conditions are right, the Alps are something akin to a paradise on Earth. Crisp air, fertile greenery, jagged cliffs, cut-glass peaks, and cowbell jingles ignite the senses and make you feel more alive than you’ve ever been. But when the clouds come in low, rain and snow make hiking trails treacherous, and all you seem to smell is cow poop–yeah, not so much. Such was the lot for another one of my tours. 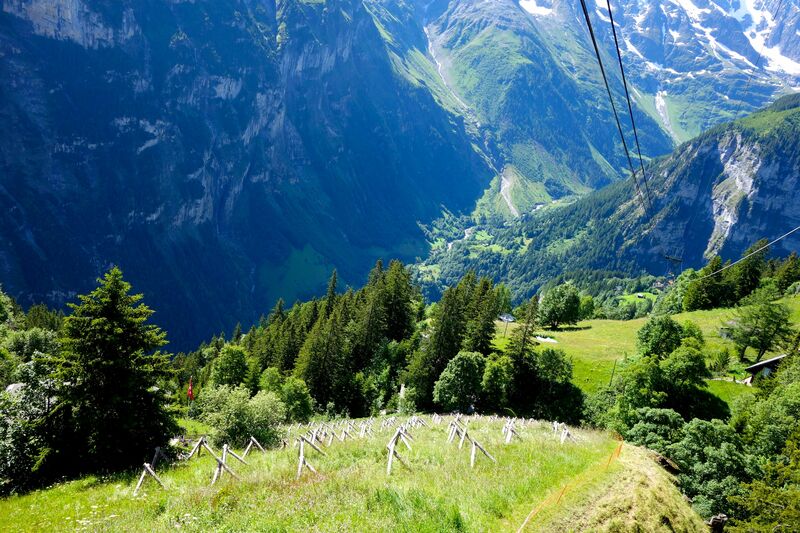 We planned to ride the gondola up to the Schilthorn–10,000 feet above sea level–and then come back down to 6,000 feet to hike from village to village along the cliffs above the valley floor. But Mother Nature had other plans for us. She can be finicky and temperamental in the Alps, and if you happen to catch her on one of those days, too bad for you. She welcomed us with snow on the high trails (closing many of them), rain everywhere else (water run-off made it too slippery for many hikers), and thick fog that obliterated views at every level from the valley to the mountaintops. Move along folks, nothing to see here. 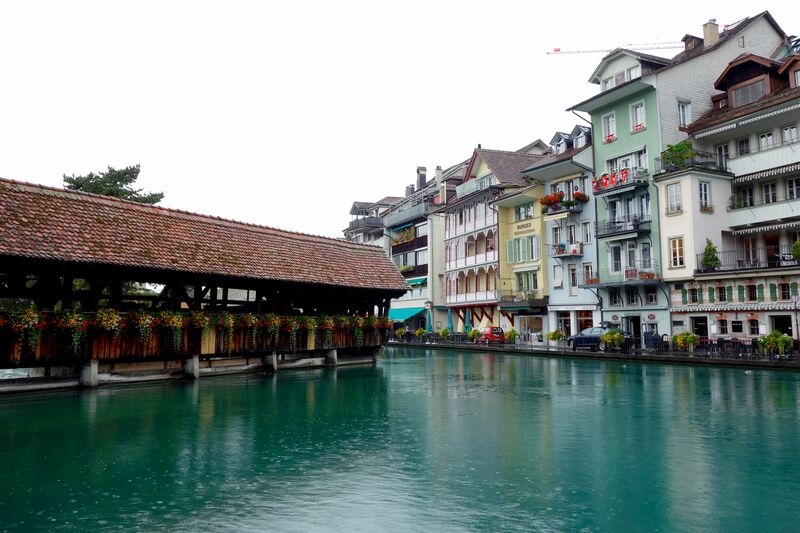 Even on a gloomy day, Thun is a lovely place to visit. We could’ve pouted. We could’ve bemoaned the day we should have had. Instead, we hopped on our bus and headed to the lakeside town of Thun, 15 miles west of Interlaken. Walking through a drizzly town appealed to the group more than sludging through a mud-filled trail you couldn’t even see, so we jumped at the chance to visit this charming Swiss place. We walked across the former watermill that straddled the Aare River, explored cobblestone lanes and public squares, and hiked to the top of the town to its 12th-century castle. There we were treated to views of the quaint architecture below, the placid lake, and the proud mountains off in the distance. It wasn’t exactly a trip to the Schilthorn, but it was lovely nonetheless and a morning well spent. 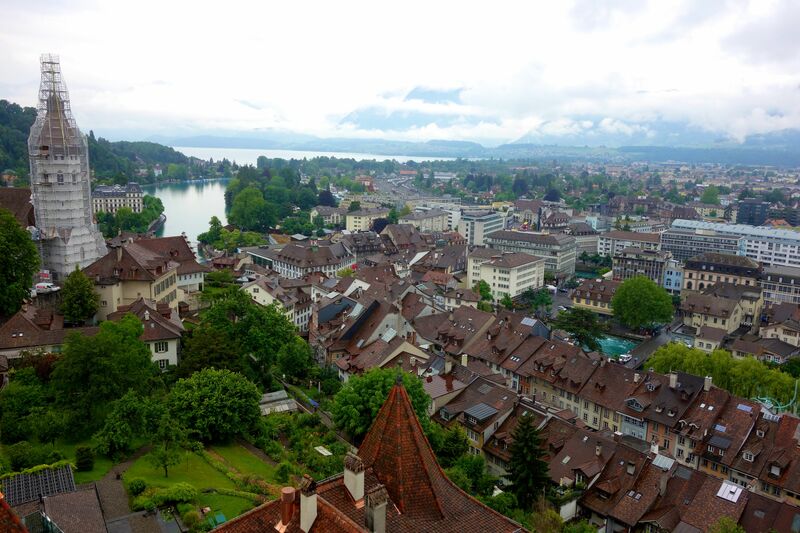 From the top of the 12th-century Thun Castle, the views are quite a sight to behold. Making our way up to the Schilthorn in a gondola, we were treated to expansive views of the villages and valleys below. As we ascended on that bright, early morning, audible gasps of awe rippled through the gondola–some from the height-wary ones but most from those stunned by the beauty above, below, and all around us. Waterfalls tumbled over 1000-foot drops along cross-section cliffs, feeding the Weisse Lütschine River that flows to the Thun and Brienz Lakes. Emerald green fields extended their lushness from the ridge-side villages to the bases of the ubiquitous mountains. Alpine lakes sported their last remnants of snow-white ice and reflected the mountains and skies above. THIS is what we came to Switzerland for! At the summit, anyone without his jaw dropped open in awe was the odd man out. There is no greater art than Nature herself, and only a fool can be immune to her majesty and beauty. These massive monoliths of rock and earth that had taken millions of years to form stood like proud sentinels in every direction around us. 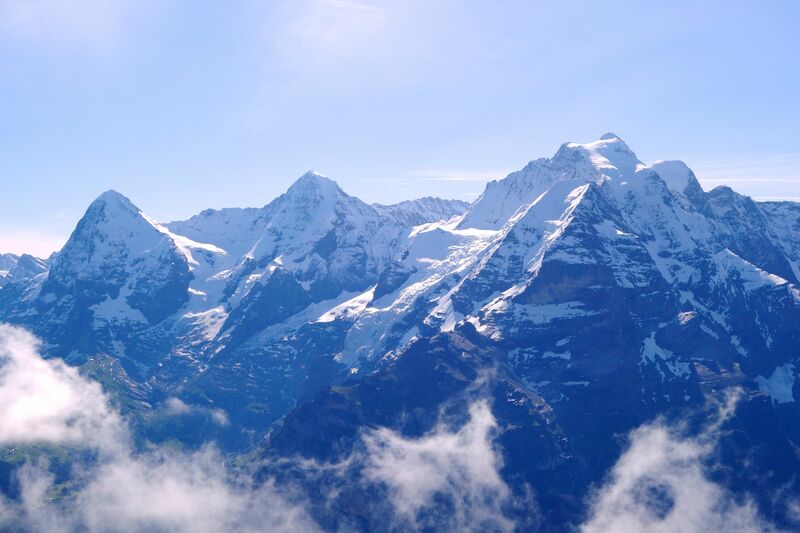 The Eiger, Mönch, and Jungfrau glistened a blinding white light as the sun bounced off their glacial peaks. Such views make one feel so gloriously grand and so beautifully insignificant all at the same time. As we stood on the platform overlooking the alpine landscape, I think we were all counting our blessings for having such horrible weather the day before. Without it, we’d never have gotten to know Thun or seen the Swiss Alps as they ought to be seen. No matter how much we plan our vacations, travel can be full of surprises, unexpected moments, and plan-changing events. It doesn’t always work out in our favor. As the Scots poet Robert Burns can attest, even the best laid plans of mice and men often go awry. But when we accept those travel hiccups as new experiences, we can be rewarded with magical moments we never could have planned. And that’s one of the best things we can hope for in our travels. Vacations should be perfect. At least that’s what we all think, given how much time, money, and effort it requires on our part to make our vacation dreams a reality. We scrimp, we save, we plan, we organize, and we do all the necessary things to get our travel ducks in a row. And then…it rains. Hard. Or it snows. And the roads are closed. Then the restaurant is closed. And the whole country seems to be on strike. The woes of a traveler can be great, but they can be minimized when we remember to keep things in perspective. Sure, we’re inconvenienced, but at least we’re all in the same boat with the locals and the other travelers whose plans now have to change. And things could always be worse. Or you could be back at home, sitting in your tiny cubicle, pushing paper under the annoying hum of florescent lamps, and watching the clock tick slowly. The best thing to do is take a deep breath, remember how fortunate we are to travel, and quickly come up with plan B. As a tour guide, I’ve had to come up with many a plan B, C, and even D to keep my tour members happy, engaged, and active. You can imagine the stress it can cause to quickly scramble together an alternative plan that will satisfy 28 different people who had their hearts set on something else. And yet, it always seems to work out. Why? Because everyone is willing to go with the flow. Hi Trish, Loved your post. Brought back wonderful memories of tromping through Rome…thoroughly soaked but so happy to be exploring Roma with Brad. And, my first glimpse of the awe-inspiring Eiger, Monch and Jungfrau was at about 5 a.m., when Dave came in to the loft at Walter’s to wake all of us sleeping up there to marvel at those amazing peaks – which were crystal clear and glowing in the pre-dawn sky. It had been completely socked in the day before; nothing was visible! I couldn’t have imagined how stunning those mountains were. It was truly a magic moment to behold them. Thanks, Mary! I’m really thankful that you’re following The Travelphile. I don’t know if I would have been rugged enough to sleep in Walter’s loft, but the reward of waking up to the beauty of the Swiss Alps is pretty darn priceless. great post Trish! Thanks to your “alternate” plans, I don’t think anything was lost on our trip. You made every moment count! Besides-how often can you take pictures of Notre Dame with the gargoyles actually spewing water out of their mouths? Al! How are you and Jackie? You two are such great, go-with-the-flow travelers. Thanks for your eagerness and positive attitude during the tour. I hope you’re coming to the tour reunion in January! Hi, Jackie! Happy belated Thanksgiving to you and Al! And speaking of Disney, check out my new and upcoming blogs. You might get a kick out of it. I’m sorry we’ll miss you at the reunion, but maybe we’ll see each other in Europe in the not-too-distant future! Missed your posts; glad you’re able to write again inspire of your very busy schedule! Love you! Liked this post for its honest acknowledgement that despite all the effort and money to travel to places we’ve dreamed about, sometimes it doesn’t quite work out like we hoped. On my wife and I’s trip to France a couple years ago the rains hit in the Dordogne and lasted through our time at Carcassonne. I remember venturing up to hilltop towns where the panoramic views ended up being panoramic views of gray clouds. It was a bummer that our experience of an amazing place was colored by something like the weather, but we still found a way to make a memory. Just a different one. In Carcassonne, we escaped the cold rain and huddled in a restaurant over steaming cassoulet, enjoying our respite and the experience in a way we wouldn’t have if it had been sunny and 70… I enjoy reading about your travel adventures. It holds me over til the next trip! That’s a wonderful way to look at that experience: finding a way to make a different memory than you had planned. In fact, I often think that in the cases when things not only don’t go as I planned but go annoyingly wrong, it simply gives me a more interesting story to tell friends instead of, “everything was great.” Smooth sailing doesn’t test your travel skills. Learning to adjust to the winds and waves does. Thanks for following The Travelphile, Scott! Trish, your beautifully descriptive writing literally pulls me into a cold and rainy Paris/Switzerland. I had to go make a cup of tea to warm up! Blessings in 2015! Deborah, thank you so much! I hope you and Tom enjoy your upcoming travel plans. It would be so great to see you both and the whole family again! Ha! Misspelled my NAME. Can you please correct Deboraa to Deborah?